This document describes a workflow for contributing to projects that have a protected master branch. The contribution process involves making an edit, creating a new branch, creating a pull request, merging the pull request, and then deleting the branch you created. Follow the steps below to make a contribution. Browse the project and use the pencil icon to edit a file like you normally would. On the edit page, make whatever changes you would like. Click Commit Changes to save your work. Once you are finished with your changes, create a Pull Request. 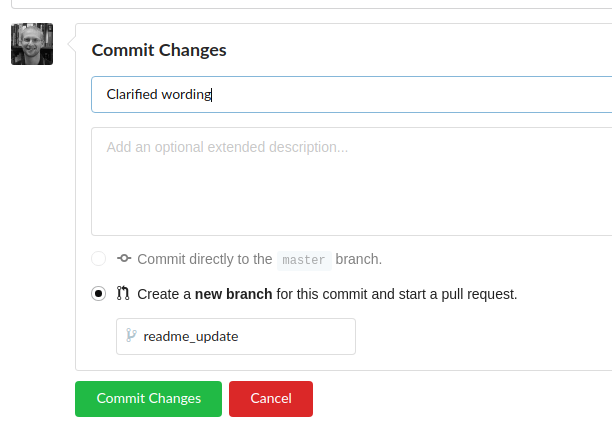 Once your changes have been made you can create a pull request to merge them into the master branch. Follow these steps. Under the name of you project, click the “Pull Requests” button that has a number next to it. Now click the green “New Pull Request” button in the upper right. Give your pull request a title in the title box. Fill out the description box under “Write” to provide others a description of the changes you are suggesting. In this step, usually someone else on the project should be the person to merge the pull request into the master branch. This may include some discussion or changes to your initial edits, which can be made directly on the new branch you created. Click Yes on the warning dialog that pops up. Note that because the branch has already been merged into master, there is no data loss in this operation.